Irene is a musical with a book by James Montgomery, lyrics by Joseph McCarthy, and music by Harry Tierney. Based on Montgomery's play Irene O'Dare, it is set in New York City's Upper West Side and focuses on immigrant shop assistant Irene O'Dare, who is introduced to Long Island's high society when she's hired by one of its leading grande dames to help redecorate her home. The musical opened on Broadway in 1919 and ran for 675 performances, at the time the record for the longest-running musical in Broadway history, which it maintained for nearly two decades. It starred Edith Day in the title role, who repeated the role in the London production. It was revived on Broadway in 1923, filmed twice, and had a major Broadway revival in 1973, starring Debbie Reynolds, followed by a 1976 London run that lasted 974 performances. The original Broadway production, directed by Edward Royce, opened on November 18, 1919 at the Vanderbilt Theatre, where it ran for 675 performances, at the time the record for the longest-running show in Broadway history, one it maintained for nearly two decades. The cast included Edith Day as Irene, Walter Regan as tycoon Donald Marshall, Eva Puck as Helen Cheston, Gladys Miller as Jane Gilmour, and Bobby Watson as 'Madame Lucy', a flamboyant male dress designer. The show made a star of Day, who departed the cast after five months to recreate her role at London's Empire Theatre, where it ran for 399 performances. Day was replaced in the Broadway production by Helen Shipman. 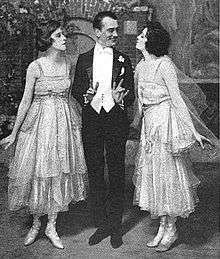 Irene enjoyed a brief Broadway revival at Jolson's 59th Street Theatre in 1923 with Dale Winter as Irene, Jere Delaney as Madame Lucy, and Walter Regan reprising his role as Donald. Eventually there were seventeen national touring companies, and it was filmed twice, first as a 1926 silent movie with Colleen Moore and again in 1940 with Anna Neagle. In 1971, the revival of the 1925 musical No, No, Nanette with screen legend Ruby Keeler proved to be an enormous hit. Its producer, Harry Rigby, deciding to cash in on the nostalgia craze by reviving another vintage show with another glamorous movie star as its centerpiece, zeroed in on Irene with Debbie Reynolds making her Broadway debut in the title role. Rigby hired librettist Hugh Wheeler to rework the show, which retained only five of the original songs and added tunes written by McCarthy with other composers and original numbers by Charles Gaynor and Otis Clements, with additional material by Wally Harper and Jack Lloyd, written specifically for the revival. The production was troubled from the start. Billy De Wolfe was forced to withdraw due to illness and was replaced by George S. Irving as Madame Lucy. Reviews in Toronto were mixed, and when Reynolds was stricken with a throat ailment, the producers, rather than cancel the sell-out performances, had her mime her dialogue and songs on stage to director John Gielgud's reading of them from the wings, much to the dismay of angry audiences. Philadelphia critics were brutal, and Gielgud, an odd choice for a lightweight musical comedy, was replaced by Gower Champion, who had helmed a Los Angeles revival of Annie Get Your Gun with Reynolds. Peter Gennaro was hired to restage the musical numbers, and Joseph Stein was brought in to doctor the book, which now had Irene posing as a countess in cahoots with couturier Madame Lucy (the former Liam O'Dougherty) in a scheme to promote his fashions. Postponing the Broadway opening, the producers brought the work-in-progress to Washington, D.C., where it was seen by President Nixon and his family. Their declaration that Irene was a hit made headlines and spurred advance-ticket sales in New York City. After thirteen previews, the revival opened on March 13, 1973 as the inaugural production of the Minskoff Theatre, where it ran for 594 performances. In addition to Reynolds and Irving (who won the Tony Award for his performance), the cast included Patsy Kelly, Monte Markham as Donald, Ruth Warrick, Janie Sell, Meg Bussert, and Reynolds' daughter Carrie Fisher. While reviews were still mixed, the all-important Clive Barnes of the New York Times described it as "raucous, frequently cheerful, and the best 1919 musical in town." In February 1974, Reynolds' former MGM co-star, Jane Powell, replaced her. "I'm Always Chasing Rainbows", which had been cut during the pre-Broadway run (although Reynolds' rendition was included in the original cast album), was restored to the score. Reynolds returned to play the final week in New York, then took the show on tour, playing for five months before being replaced again by Powell. The Broadway revival led to a 1973 Australian production with Julie Anthony, who then went on to star in a 1976 London revival at the Adelphi Theatre, directed by Freddie Carpenter and choreographed by Norman Maen, that lasted 974 performances. The cast also included Jon Pertwee and Eric Flynn. Additional changes were made in the song list. Irene O'Dare is a humble but ambitious, hard-working Irish girl from the humble West side of Manhattan, who runs a little music store with her widowed mother. Irene is sent to tune a piano for young tycoon Donald Marshall III, a Long Island society gentleman. Once at Donald's estate, Irene falls in love with him, and each is captivated by how different the other is from their usual friends. Donald's ne'er-do-well cousin Ozzie wants help to jump-start a fashion business to be run by his friend, "Madame Lucy", a flamboyant male artiste, who pretends to be a famous French couturier. Irene and her pretty best friends, Helen McFudd and Jane Burke, are recruited to model Madame Lucy's gowns, while Donald provides financing. Irene agrees to pose as a society girl to convince everyone to shop at Madame Lucy's, but she becomes angry with Donald when he asks her to continue the ruse. Meanwhile, Irene's mother and Donald's mother do not see eye-to-eye. Madame Lucy, Helen, Jane and Ozzie are overjoyed at their success, as Madame Lucy's creations are now world-famous. Donald realizes that he loves Irene. He goes to the piano store but on the way he runs into some unsavory fellows who beat him badly. He and Irene reconcile but then argue again, and he runs out. Helen and Jane give Donald some advice about acting like a man and wooing Irene properly. Following their counsel, he sweeps her into his arms and kisses her passionately, which results in more bruises, this time from her. At the grand ball at Donald's estate, Irene finds her mother brokenhearted over the love of her life, Liam O'Dougherty. It turns out that Madame Lucy is Liam O'Dougherty, and he reunites happily with Irene's mother. Donald announces that he loves Irene, and her true identity is revealed. He tells her: "You made me love you", and all ends happily. 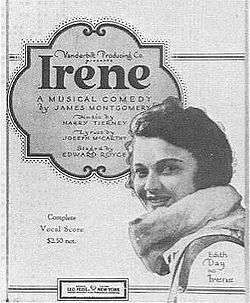 Irene was adapted for a 1926 silent film starring Colleen Moore, a June 1936 Lux Radio Theatre production with Jeanette MacDonald and Regis Toomey, and a 1940 film remake starring Anna Neagle and Ray Milland.